At that moment, my pain felt equal to — if not even more than — what I imagined any physical illness could pose. The constant anxiety, sadness, fear, and despair strangled me. I felt inexorably alone and as if I were dying a slow death of emotional asphyxiation. I may not have been diagnosed with incurable cancer of a vital organ, but I knew I was in the throes of battle with what felt like cancer of the soul. It appears in her “Medication Merry-Go-Around” chapter right after she lists all the drugs that she’s tried, but which failed to give her any relief. This includes Zoloft (sertraline), Xanax (alprazolam), Lexapro (escitalopram), Paxil (paroxetine), venlafaxine (formerly sold as Effexor), Lamictal (lamotrigine), Concerta (methylphenidate), Topamax (topiramate), Seroquel (quetiapine), Klonopin (clonazepam), and Abilify (aripiprazole). Her feisty spirit is inspiring because it’s what ultimately leads her to health. My decision to stop taking all medications might be regarded as irrational, equal to the opposite — and extreme — action of overdosing on Xanax [which she did earlier], but I saw myself on a maddening merry-go-round with no bright and stately horses on which to ride. If my body could not tolerate the burdensome side effects of taking the drugs, drugs that hardly put a dent in my depressive symptoms, I meant to find out what my body could tolerate without them. In retrospect, I see the enormous risk I took and would not recommend it to anyone. Sudden and total cessation of antidepressants, as is the case with many other medicines, can lead to catastrophic reverberations such as seizures. At the time, however, a persistent survival instinct trumped my confidence that antidepressants would do me any good. I had given up on psychiatrist appointments and the 10-minute medicine meet-ups. Mistrust, negativity, and unbounded frustration clouded any consideration to look for another doctor who might be a better caregiver. Other than continuing appointments with my talk therapist, I had essentially stranded myself on an island when I cut myself off from the traditional, well-traveled road of available drug treatment options. Without any buoy to reach for, Martha is left horribly depressed and hopeless, drowning in the open sea. She considers electroconvulsive therapy (ECT), but can’t get past the possibility of memory loss. Then came her miracle, as she describes it, in the form of a magazine ad for transcranial magnetic stimulation (TMS), with the headline, “Treat Depression Without Medication.” TMS is a non-invasive procedure that stimulates nerve cells in the brain with short magnetic pulses. A large electromagnetic coil is placed against the scalp, which generates focused pulses that pass through the skull and stimulate the cerebral cortex of the brain, a region that regulates mood. The procedure was approved by the FDA in 2008. Although I know ECT is a viable and worthy therapy for patients who suffer with severe depression and need more relief than medications can provide, I have to acknowledge that at the time, for me, it seemed too invasive. It required general anesthesia with its inherent risks and had cognitive side effects, including memory loss I was unwilling to chance. TMS is performed in an outpatient setting that does not require anesthesia and hence allows patients to return to their homes or work immediately after treatment … Most important, studies have proved that TMS has a comparable success rate to ECT in non-psychotic patient trials, and the outcome for TMS patients is as predictable as ECT. 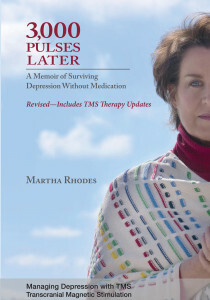 Then, as a woman on a mission, she informs health plan providers that maybe not all patients who are unresponsive to medication need the degree of invasive therapy that ECT poses, and that it would certainly benefit them financially (when you compare the costs incurred with both therapies) to open their minds to this revolutionary way of treating retractable depression. Kira Stein, MD, board certified psychiatrist and medical director of the West Coast TMS Institute in Sherman Oaks, California, is excited about the success she’s had in treating her patients with TMS. Dr. Stein usually does five sessions a week, for a total of 30 sessions; the entire procedure lasts about six to eight weeks, though some patients may need more treatment to respond. She estimates that about one-third of TMS patients have a full remission and no longer experience depression symptoms. One-half of people treated with TMS respond significantly — their depression symptoms improve by at least 50 percent — but they do not reach complete remission. TMS provided Martha such relief that she has made a second career as a TMS Patient Advocate, promoting the treatment and sharing her incredible story with others across the country. Somewhere around my 20th session [of TMS] I woke up one morning and that disgusting “UGH! !” feeling was gone — the feeling that’s a thousand times worse than the “I wish it wasn’t Monday morning and I didn’t have to go to work!” feeling. (I call it “emotional nausea.”) A gentle lightness came over me as if I was lifted out of a dark hole. I noticed the music I listened to during my drives to and from my treatments was more upbeat, and I found myself actually singing to the music! I began reaching out to friends again, to talk on the phone, go out to dinner — and I actually caught myself laughing. My energy increased and life felt amazingly manageable. I’m relieved and thankful there’s an effective, non-drug treatment that’s applied directly to my brain and doesn’t affect the rest of my body. Not only have I recaptured my life, I’ve actually gained more than I had to begin with. I feel more real and clearer now than I have ever felt before. And most important, I have a newfound value for my life — it really is worth living! Join the Exploring TMS group on ProjectBeyondBlue.com, the new depression community.